Keep More of Your Money! End Grocery Overspending Once & For All! When’s the last time you tallied up how much you spend on food per month? Now, I’m not talking about take-out or special occasion dinners – I mean JUST groceries. If you add up all the trips to the supermarket, Costco or Sam’s, and the snack food you grab while at Target, you might be stunned to see that what you thought was a reasonable amount is literally busting your budget! I know, I know – budget seems like a boring, no-fun kind of word to some people. But you and I know that budgets are an important way to feed your family while staying financially healthy, so you try to stick to one. Still, with rising prices and the sheer chaos of weekly grocery shopping, it can feel downright impossible to feed your family AND stay on track with your spending! Maybe you’ve tried meal planning, but then quickly realized it was taking hours of extra effort. I mean, you have to research and choose recipes, inventory what you have in the pantry and fridge, make sure everything you have is still fresh, check what’s on sale, revise your recipe choices, make long and specific lists for each store – and that’s before you even leave the house! Next thing you know, you’re at the checkout, you’ve only got half of what you need for this week’s dinners, and the grand total is WAY MORE than you anticipated! – you felt in total control of the money you hand over at the checkout every week? – you were confident that you were stretching your dollars as far as they can go? – you felt FREE from the sick feeling you get when you know you’re wasting money? – you knew you were serving your family delicious, health-conscious meals? – you didn’t have to spend tons of time preparing, researching and shopping? – you had a system where all of this was not only possible, but your new normal? 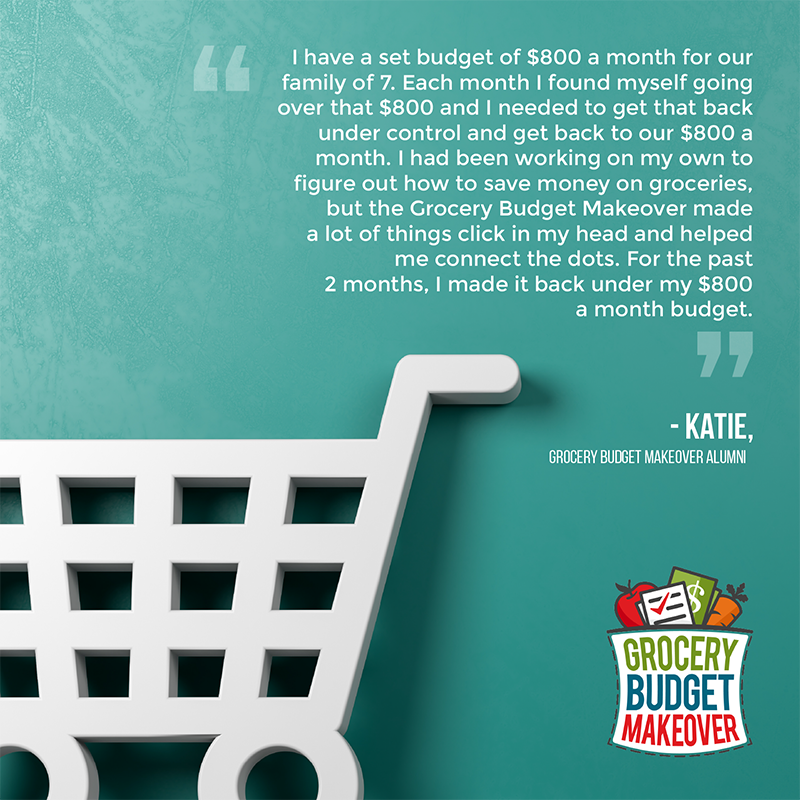 If you like the way this sounds, you’re going to LOVE the Grocery Budget Makeover! This is SO MUCH MORE than just another printable or non-specific shopping list, and it’s WAY BETTER than a judgy “Buy This, Not That” article that doesn’t really fit your family’s needs. The Grocery Budget Makeover is a TOTAL SPENDING OVERHAUL that will help you STOP OVERSPENDING, STOP WASTING MONEY, and FOREVER CHANGE your mindset and strategy when it comes to grocery shopping. When you’re done with this program, you will confidently walk the aisles of your supermarket, knowing that you’re snagging THE BEST DEALS and getting all the things you need to make the MOST DELICIOUS MEALS at home! The Grocery Budget Makeover will totally change the way you shop for groceries – you will spend less money in the store, AND less time in the planning and prep process! Years ago I would wander through the grocery store, randomly grabbing ingredients that I thought would make a nice, simple meal and tossing them into my cart. I didn’t pay attention to shelf tags, sale prices, store ads…I just showed up, shopped and left. Sometimes I forgot things and had to run back to the store, sometimes I left things in the back of the fridge too long and forgot to use them, and sometimes I just gave up and ordered a pizza because it was easier. I flushed way too much money down the drain with this kind of shopping style. One day, I totaled up our spending and was CRUSHED to find that our food cost had ballooned way out of control – it was more than DOUBLE what I estimated I should spend. I had to get things under control – my family’s finances depended on it. So, I set out to cut our family grocery bill and create a plan so I wouldn’t waste money and food again. It took some time to figure it all out, but the combination of strategies and tactics that I utilized completely changed the way I shop forever. I was able to reduce our grocery spending by HALF! Our family of (then) four quickly went from spending over $500 per month to still eating phenomenal meals for $250 per month! This sounds amazing, right? What would you do with hundreds of extra dollars in YOUR budget? There’s a lot to the grocery planning process and routine, but when you have all the pieces working well together, you can start to see these same significant savings! Want all the pieces to the grocery shopping puzzle for yourself? 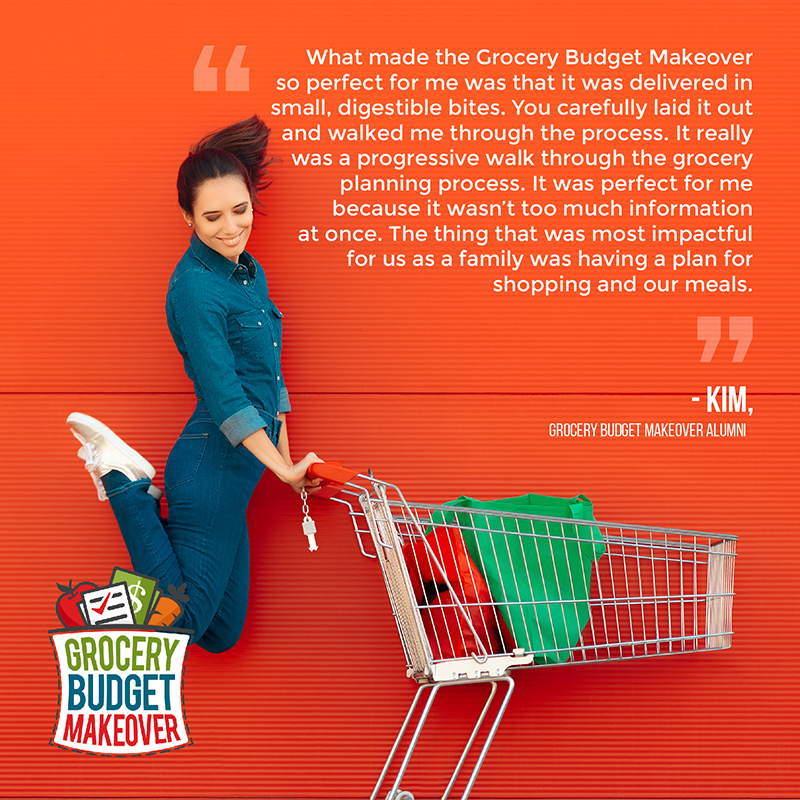 I’ve created an incredible resource for you – the Grocery Budget Makeover. While I’ve shared many, many, many budget friendly recipes on $5 Dinners for almost 10 years, I’ve never actually pulled together all of my shopping, meal planning, couponing and cooking strategies into one place. That’s what the Grocery Budget Makeover is all about…it’s all my secrets and tactics, put together in a way that’s easy to digest (pun intended!) and guides you on a journey to spending way less money on groceries than you are now. So how does the Grocery Budget Makeover work? 10 lessons with instructional and informational videos – You’ll reframe your thoughts and learn cool new strategies – rather than a static classroom environment, you’ll feel like we’re sitting together in my kitchen chatting. You’ll learn everything from how to create time saving (instead of time sucking!) shopping lists, shopping and cooking hacks, and (this is a favorite of mine!) how to score FREE groceries. YES, FREE groceries DO exist, and you’ll be able to snag them! Each lesson contains worksheets and printable resources – These worksheets (combined with the videos) will be your lifeline through the makeover. They will make the strategies discussed in the videos perfect for your family and your situation. You’ll quickly identify areas to improve, and help you quickly and easily make changes in this journey. Cooking demo videos – Every couple lessons, I’ll share a cooking demo of a related recipe – you can learn new techniques and cook more confidently! Access to a super secret Facebook group – You’ll get support and actually HAVE FUN chatting with like-minded people. Hang out, inspire each other and encourage each other…and of course, I’ll be chiming in, too. If you love social support, this will be a big part of your success! Special Bonus 1 – my Grocery Budget Formula worksheet – save time by using this done-for-you resource! Special Bonus 2 – Special video for how to deal with food allergies on a budget, so you don’t spend too much on overpriced products. Special Bonus 3 – Special video about all the great grocery savings mobile apps so you can save from the palm of your hand. NEW – Special lesson on the pros and cons of online grocery shopping, grocery pickup and grocery delivery services! Plus other fun surprises along the way! 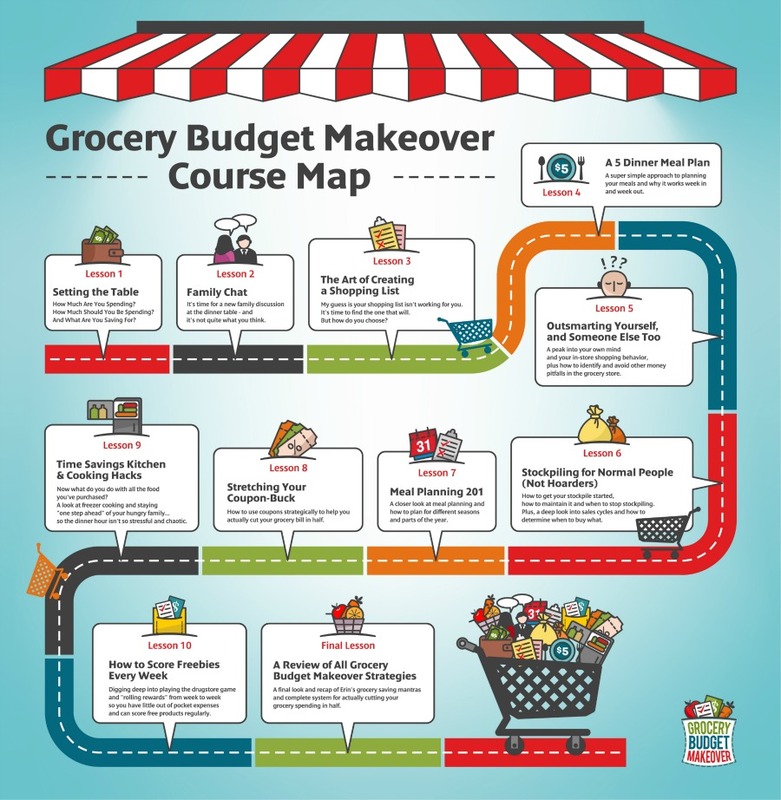 What is the Course Curriculum for the Grocery Budget Makeover? Final Review Lesson – Putting It All Together! You’ll see the option below to add the printed, bound workbook to your registration. We mail them to you them daily, to ensure it arrives to you quickly! I’m not sure I can afford it. Or invest in it. What’s the cost? The cost for this Grocery Budget Makeover live class is $49 total. It’s a very small investment, considering you can shave $49 off your grocery bill in the first month of the makeover! I don’t know if I have time. What’s the time investment each week? I know your time is precious, so the videos are brief – the longest one is only about 13 minutes! You can expect to spend around 30 minutes to an hour a week total – in both watching the videos and filling out your worksheets. Beyond the physical time of watching and writing, you’ll spend some time thinking each week about what I’ve taught and how to best implement the strategies into your process, but it will fit in to your schedule of prepping and shopping anyway. I’m not into processed foods – I shop for organic or all real food, and I can never find coupons for these things. Will this help? What if I want more time to think about it? Or set aside money to pay for it? Think about this – if you implemented all the strategies in the Grocery Budget Makeover, you could save hundreds or even THOUSANDS by then. When you consider that, you might not want to wait anymore! 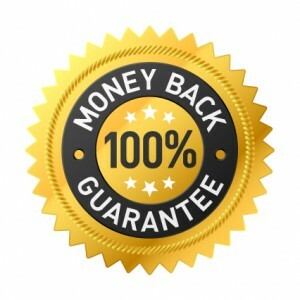 Also, we do have a payment plan available AND a satisfaction guarantee – consider this no-risk, all-reward. Proof is in the pudding. Has anyone done this makeover yet? She already her grocery spending at $500/month for 2 adults and 1 teenager. With a recent job loss, she managed to get it down to $430/month for 3 people before the makeover started. But what she learned from the Grocery Budget Makeover was how to get more ingredients and products into her grocery cart with her $430 budget. I *think* I’m doing a good job, so how will I know if this will help me? Before you decide that this isn’t for you, please check out the course curriculum. You might be a savings rock star already, but there’s a very good chance that you can SAVE EVEN MORE. Who wouldn’t want that? This sounds really involved – I’m not very ‘Type A’ when it comes to anything…much less grocery shopping. This program is designed for anyone. The content is the valuable component and you can make it ‘work for you,’ regardless of personality, organizational style or planning style. This will become your new normal – a way of thinking so easy that even the most laid-back person can implement it. Will this help me if I don’t live in the US? This program was designed by me, an American shopper. There is 1 lesson that we talk about couponing (at the end of the program), so I think there is a lot for anyone to learn and glean beyond couponing. Ready to SAVE MONEY AND TIME? You CAN succeed and learn a new way of shopping for groceries. When you complete the exercises outlined in the program, you’ll start seeing results – big, awesome MONEY SAVING RESULTS…and you’re going to LOVE IT. But if you feel like it’s not working for you, or that you aren’t getting the value from the program, you can request a refund. To be eligible for a refund, simply show completed worksheets up until the point of refund request. The only way to see results in any makeover is to take action – if you complete your work within the first 1 week, and you decide you aren’t seeing results, no problem – I will happily refund your entire purchase and you can be on your merry way. This is my “show me you’re trying and if it doesn’t work, I’ll refund your purchase” guarantee. I want to have a group of committed friends who really want to make a difference in their grocery spending. That’s right – if the course doesn’t help you save money within the first week, you get 100% of your money back. I know it will, so I’m not worried. You’ll save money within the first week if you get to work right away. I should also let you know that you’ll have lifetime access to this content, so you can move at your own pace if “life gets in the way” then you can come back and finish when your schedule allows. Registration for Erin’s Grocery Budget Makeover online class is now open…when you’re ready! Secure your spot today by registering below! Once you submit the class registration form, I’ll send you a couple of emails with information on where and how to log in into the Super Saver Headquarters. The Super Saver Headquarters is your ‘home base’ and is where you’ll get instant access to all the lessons. “By breaking the elements of grocery budget savings down into bite sized weekly pieces and initiation challenges in line with each week’s lessons, I was able to see where I was wasting my efforts and money. I don’t know that I’ll ever be a “couponer” or CVS/Walgreens deal chaser but I have significantly reduced my grocery shopping dollars through the lessons taught in this course. Thank you so much!” ~ Skylar A. Are you ready for this “Save HUNDREDS a month on groceries” Makeover??? INSTANT ACCESS to All Lessons! 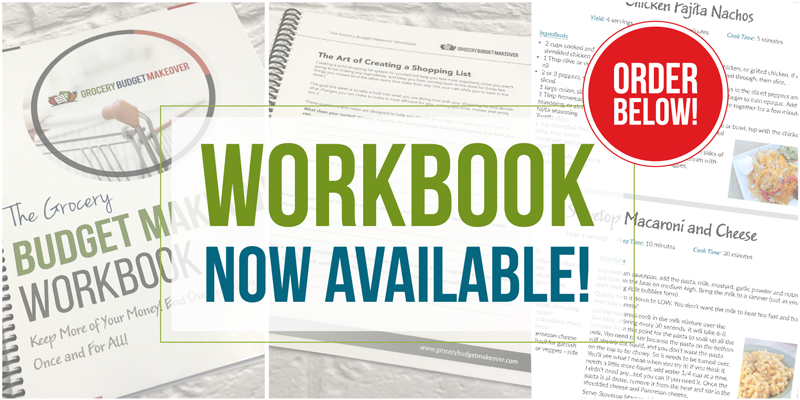 Join & Get the Workbook Too! Please note: we have Paypal options for the single payment registrations, but do not offer Paypal with the payment plan. Think about how quickly the investment will earn itself back. 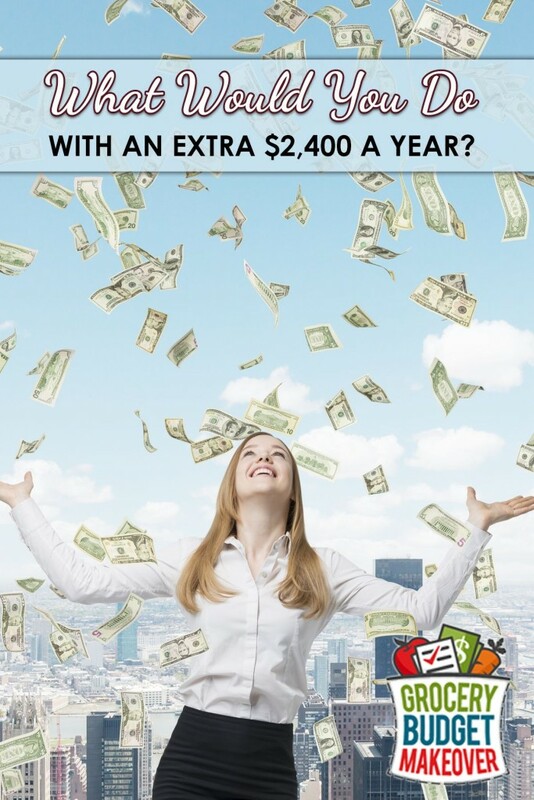 Think about what you’d do with an extra $2400 a year (if you see $200 a month savings!). Challenge yourself to multiply the investment 5 fold and try to save $250 during the course of the makeover. You can totally do this! When you commit to the makeover and learning what changes you need to make, it’ll blow you away – together we’ll rock your grocery spending! So what are you waiting for?